Playing at Golf Club Peralada is much more than just playing golf. It’s enjoying a unique experience where one of the best golf courses in the Costa Brava blends harmoniously into a beautiful Mediterranean landscape. 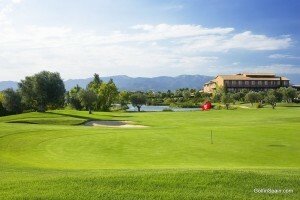 The scenario for major competitions and top-level tournaments such as the Open Catalonia 95, the stages for the PGA Pre-Qualifying School and the Seniors Qualifying School, it is also the first golf course in Europe to obtain EMAS Environmental Management certification, recognised by the European Union. Enjoy a wonderful 18-hole course with a distance of 6,071 metres, par 71 and 4 starting tees for each hole. With few slopes, lake areas, banks and trees, the course is suitable for all types of players. The Club Golf Peralada School has modern facilities for teaching students and for perfecting their game; including a driving range on two levels (the bottom one covered and with floodlights), 9-hole pitch & putt, approach areas, three putting-greens and a practice bunker. With its exceptional facilities, the golf school offers high-quality beginner and advanced courses, under the instruction of Paul Brown, a professional teacher and a member of PGA Spain, and Marc Malafosse, 2nd-level teacher and member of PGA France. Classes are daily, last for 3 hours and include a review of all golf shots in a guaranteed friendly atmosphere. Unlimited access to the 18-hole course for advanced students and the P&P course for beginners.